How to calculate the return on sales? 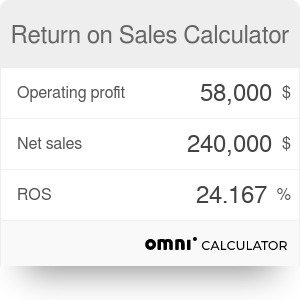 Return on sales calculator is a tool which makes it easier for you to calculate return on sales (ROS in short). If you wonder what it is, you're at a right place - in this short article, we will explain how to calculate the return on sales and how to evaluate the result. Additionally, we will provide you with a simple-to-use return on sales formula and illustrate its usefulness with a step-by-step example. Return on sales is an indicator which measures both the profitability and efficiency of a company. It tells us how much net profit a company produces from its sales revenue after deducting all of the costs and taxes. In simple words, it shows what percentage of each dollar of sales is converted into profit. For example, if a company keeps $0.17 out of each dollar of sales, it means that its ROS is at a level of 17%. Return on sales is especially useful when comparing the profitability of a company between different periods. When the value of ROS increases, it is a sign that a company is growing efficiently and its financial condition is improving; when it decreases over time, it may mean that a company has some troubles converting revenue into profit. The return on sales is calculated by dividing the operating profit of a company by its net sales. As this indicator is always expressed by a percentage, the last step of calculations is multiplying the obtained fraction by 100%. Operating profit - the profit from a company's business operations, so the gross profit decreased by operating expenses, depreciation and amortization. If a company doesn't have any non-operating revenue (e.g., from interests or sales of assets), its operating profit is equal to EBIT. Net sales - gross sales of a company adjusted by discounts, allowances, or returns. Imagine a company "Sports Extreme" that sells sports equipment. It generates $200k net sales each month but requires $170k of costs in order to generate this revenue. Its competitor, "Star Active," has sales at the level of $50k, but their costs are much lower - only $35k. Which of the two companies has a higher return on sales? Return on sales for "Sports Extreme" is at a reasonably high level of 15%. The second company, though, managed to achieve an astonishingly high ROS of 30%! Most enterprises out there are usually satisfied with a return on sales at the level of 5-10%; it means that both companies we just analyzed are indeed profitable. Naturally, to have a full picture, it would be highly advisable to take a look at the changes in ROS over the period of 2-3 years. ROCE - this is a ratio which shows us the efficiency of a company basing on the amount of capital it uses. Return on Sales Calculator can be embedded on your website to enrich the content you wrote and make it easier for your visitors to understand your message.